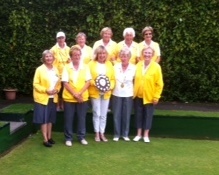 Ponteland contested the double rinks final against Burradon on Thursday 20th August 2015. Unfortunately, they were runners up but congratulations to everyone for reaching the final. Back row (L to R) - Jennifer Nixon, Adrienne Brennan, Anne Rutter, Margaret Cowan and Pam Varley. Front row (L to R) - Liz Emmerson, Allison Storey and, far right, Gloria Stapylton. 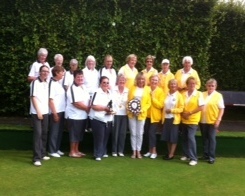 Liz Cowings, Ponteland Ladies President, and Mary McNally, Northumberland Ladies County President, are centre front.